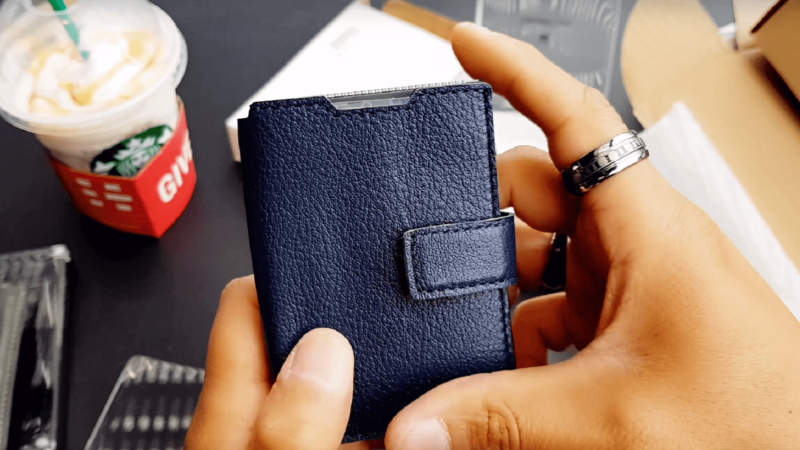 The best card holder in the world because it is very practical and with a single click all the cards come out uniformly. If there are people that spend a thousand dollars on a pair of shoes and there are people who spend up to five thousand dollars in a watch, this luxury wallet is definitely worth for hundred dollars and change to get a RFID protection wallet. The presentation and acrylic box packaging is very nice. It makes a great gift. This smart wallet is manufactured out of full aluminium wallet, practically a work of engineering brilliance. The first contact with the wallet is delicious and feels very fine. The leather cover gives the opportunity to store bills, cash, tickets, coins and much more. The full-grain leather protects and covers the cascade wallet surface. The cascade wallet has laser engraved “Designed By Mani Wonders in Toronto”. The Canadian company designed keeping in mind the need for more space for the tickets, cards and more possibilities of you to be able to put more things. The design style of the wallet is urban, economical and specially designed for the executive management. Imagine this wallet with your cellphone on the dinner table at a rooftop upscale restaurant. It looks very elegant and posh, similar to a high end sports vehicle – Lamborghini Aventador. The technology looks modern and targets the taste level of the new generation. We are very close to Christmas and this gadget would be an excellent gift with my highest recommendation. This complete wallet is for the centuries, the fine grain leather, quality finish and proudly claim as the best wallet this world has to offer.